Finally, someone has brought the bougie world what it desperately needed: latte selfies. Say hello to The Ripple Maker, a recently unveiled 3D printer and coffee inkjet hybrid that allows you to take your perfectly good latte and emblazon it with a selfie, photo of your mom, insult -- whatever you want, but most likely a selfie, because what's the point of a photo if it isn't narcissistic? 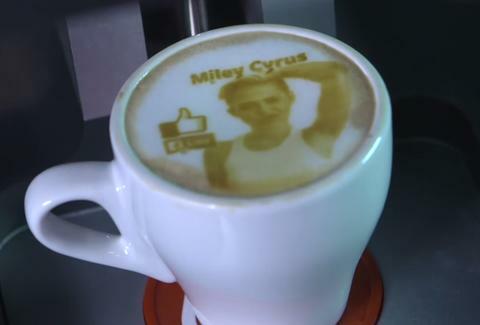 Just imagine, looking down at your mug of coffee just to see your own mug, printed on the foam, staring back up at you. Specifically, the $999 machine produces tiny coffee droplets from coffee extract pods to print the high-resolution images on top of pre-made lattes and other foamy coffee beverages in 10 seconds, according to the machine's maker, Steam CC. And while sipping your selfies is the most obvious and cringeworthy self-cannibalistic use of such incredible technology, for another $75 per month, the machine can access a library of greetings and images your favorite coffeeshop can use to surprise, delight, and potentially creep you out. If anything, this thing could be a freaking GAME CHANGER for cafe pick-up lines -- and even phone numbers -- PRINTED ON COFFEE. It's like those candy hearts, but for hipsters. If this is the future, we might have to switch to tea. Tony Merevick is Cities News Editor at Thrillist and would inevitably get foamy selfie on his big nose. Send news tips to news@thrillist.com and follow him on Twitter @tonymerevick.